Pope Francis is due to arrive in Istanbul meet Muslim and Christian leaders of the city on the second day of his three-day visit to Turkey. Istanbul, previously known Constantinople, was Byzantine’s capital until the Ottoman conquest in 1453. Pope Francis will also visit a mosque and hold mass at a Catholic cathedral. Yesterday the pontiff called for an interfaith dialogue to counter fanaticism and fundamentalism during a visit to the Turkish capital Ankara. He also called for a renewed Middle East peace push, saying the region had “for too long been a theatre of fratricidal wars”. 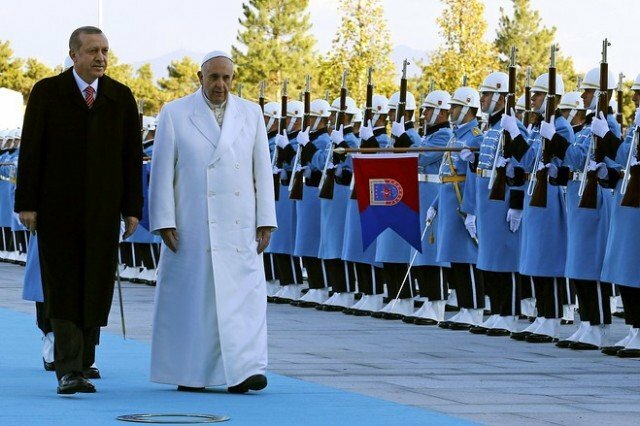 Pope Francis’ trip is only the fourth visit by a pontiff to Turkey. Most of the country’s 80 million citizens are Muslims, and there are about 120,000 Christians. The Pope will begin his visit to Istanbul with a visit to Hagia Sofia – for almost 1,000 years the most important Orthodox cathedral, then for nearly five centuries a mosque under the Ottomans, currently a museum. He will then hold meetings with Muslim leaders at the Blue Mosque, one of the greatest masterpieces of Ottoman architecture. Later in the day, Pope Francis will celebrate mass at the Catholic Cathedral of the Holy Spirit and then will meet Bartholomew I – the “first among equals” of the Orthodox Church. Correspondents say Pope Francis and Bartholomew I have a strong personal relationship, and discussions are expected to focus on healing the schism in the Christian Church that divided it between Rome and Constantinople. In Ankara, Pope Francis stressed the need for reconciliation and dialogue between the religions.